Does your programming have creativity, cultural s ensitivity and relevance to people of color? 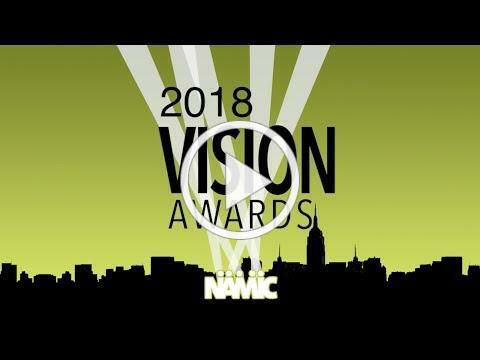 Then it's perfect to submit for a NAMIC Vision Award! Showcase your awesome multicultural programming by Monday, December 10. We celebrate Native American Heritage Month each November as a time to recognize the diverse cultures and contributions of Native people. Check out the programming section to see the special collection of films and short stories PBS has in store for this important month. Cox Communications, graduated from the Class of 2018 Lead Virginia Program, educating Virginia's leaders about the issues most relevant to the Commonwealth. NAMIC-Atlanta member Danyelle R. Carter, principal, Her Communications Agency, a communications and public affairs company that works with women-entrepreneurs, will be honored at the historic National Press Club in Washington, D.C. as one of PR News' 2018 National Rising Stars. NAMIC-Southern California president Sandy Nunez, coordinating producer, Studio Production, ESPN will be honored at the Women of Inspiration Awards Gala as a recipient of the 2018 Women of Inspiration Award. NAMIC congratulates the talented executives who were named on the 2018 Cablefax Most Powerful Women list. Thank you for your leadership, innovation and inspiration. NAMIC-New York held two events at the LinkedIn headquarters on November 14 during their Career Month Office Hours series. "Pivots and Promotions: Effective Strategies to Land the Job You Want" was led by Angela Ellis, executive broadcast producer, Good Morning America and provided insight into smart ways to transition into a new career and position. "The Anatomy of a Six-Figure Resume" was led by Niya Allen-Vatel, owner of Career Global and provided tangible ways to take a resume to the executive level. Writers and editors at The Harvard Crimson have gone on to be presidents (John F. Kennedy, Franklin D. Roosevelt), tech billionaires (Steve Ballmer, the former chief executive of Microsoft), news media bosses (Jeff Zucker, the head of CNN) and a number of my colleagues at The New York Times. But what the newspaper had in power, it lacked in diversity. In an industry that's been plagued with inclusivity problems (read: an industry that's kept women and people of color out of high-powered jobs for decades), this week has so far delivered some deserved breaks for three film and television creatives. It's been a whirlwind year for 36-year-old Constance Wu, star of the blockbuster "Crazy Rich Asians." The movie pulled in more than $230 million at the box office worldwide and made Hollywood history as the first mainstream film to feature an all-Asian cast and an Asian-American lead in 25 years. Progress for women in corporate America isn't just slow-it's stalled, according to new research from LeanIn.Org and McKinsey & Co. For women of color, and for black women executives especially, it's even worse. More news out of Brent Montgomery's Wheelhouse Entertainment. As the media and marketing venture approaches the one-year mark, it's tapped longtime A+E Networks veteran Sean Cohan, who is leaving the cable giant to serve as Wheelhouse's president. Within the last few years, we have seen some truly inspiring programming on television that pushes conventional norms and speaks to more diverse audiences, and a new network in the Urban One family is aiming to continue that trend courtesy of TV One. The firm plays matchmaker between digital media platforms targeting the U.S. Hispanic audience and advertising agencies looking to reach that market. H Code provides ad shops with an array of options for placing content aimed at U.S. residents with Latin American ancestry. IRI®, a global leader in innovative solutions and services for consumer, retail and media companies, announced an expanded relationship with Geoscape® (a Claritas company), a leading consumer data and segmentation provider to launch IRI and Geoscape Acculturation Audiences. This solution will help marketers target U.S. Hispanic and Asian households based on their level of acculturation and past purchase behavior at a level of scale and accuracy not historically available. November 29: NAMIC-New York's "Making Your Personal Website Work For You"
December 5: NAMIC-Mid-Atlantic & and WICT's "Celebrate the Holidays"
December 6: NAMIC-New York's "Strategic Negotiations"
December 11: NAMIC-Denver's "Social Media: Career Rocket Booster or Torpedo"
December 13: The Madison Square Garden Company & AMC Networks' "Holiday Rock & Roll Bash"
The members-only NAMIC Job Bank provides access to the best employers and most diverse candidates in the communications industry. Project Manager, Turner Broadcasting, Inc.